Holly is interesting stuff. It’s evergreen, its flowers are small white and inconspicuous but its berries are bright red and visible. 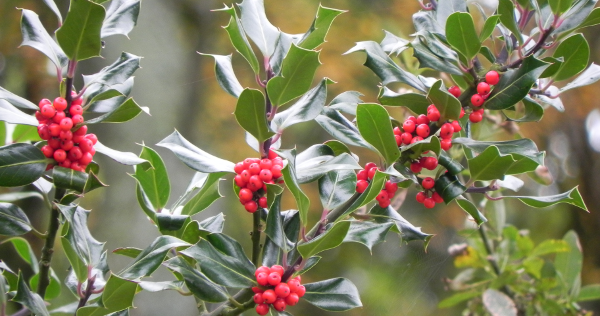 At a time of year when most trees are losing their leaves the evergreen holly with its bright red berries stands out in the woods, hedgerows and gardens. Anything that puts itself forward only has itself to blame if it becomes involved in religion. Holly, with its spiky leaves was taken to be the masculine where the ivy – also green through the winter but whose leaves lack such a defensive structure, was taken to be the feminine principle. Very early Christians, who were keen to show that their religion was pretty much the same as the one they were trying to supplant – but different, just adapted the current religious practice to their needs – so we ended up with holly and its berries becoming associated with Christmas. The holly berries are actually mildly poisonous to humans and even the birds won’t eat them until there have been a few frosts to soften them. Keep those Christmas decorations out of the reach of children and pets! Holly in heraldry stood for truth. The idea was that because the holly stayed green all year it was ‘constant and true’. Henry the vee eye eye eye – he of the many wives and also an accomplished musician – he wrote Greensleeves – wrote a song ‘Green Groweth The Holly’ in which he uses the holly’s ability to stay green through the worst of the winter to show that his love would be always true.